Leaving a farm this morning, a dragonfly started flying around in the car. I tried unsuccessfully to guide it out. As I began driving, the dragonfly bounced frantically off the dash and windshield. I was rather aggravated and frustrated because of a couple unpleasant situations swirling about in my world. As the dragonfly bounced about, I became worried it would be hurt. It took a dive into the space between the dash and windshield. It didn’t move; I thought it was injured. Aggravation, frustration and now, worry. For today only… came to mind. I started Hara breathing and connecting to Reiki. I invited the dragonfly into the Reiki space. After a few minutes, it began flying about again. I continued holding the healing space, wishing the dragonfly peace and comfort. It settled quietly on the dash in front of me and rested. I let it know I would try again to help it escape the car when we stopped. At my next stop, in a parking lot, the dragonfly flew back to a safe spot between the windshield and dash and would not come out. I let it know that was ok, the parking lot was not the best place for it anyway. Back into the car, in the Reiki space, the dragonfly began flying again. I let it know I would help it to safety when it was ready. In a minute or so, it landed on my hand and stayed there. I was in awe of its beauty and peacefulness. I found a spot near a wooded area to pull off the road. I rolled down the window; in a few seconds, the dragonfly flew away. As it flew, I heard “thank you”. I was filled with gratitude and joy my little friend was safe. I quickly realized that I was no longer frustrated and aggravated. Helping the dragonfly helped me change my perspective. The dragonfly was fighting to survive, while I was obsessing over little things that didn’t really matter in the big scheme of things. The dragonfly is part of my Reiki business logo because I have always loved dragonflies and because they represent new light and joy in Japanese culture. Once home, I looked up what it means when a dragonfly shows up in one’s life. Well, it means one may need to gain a new perspective or make a change. Or, that one is being too rational and neglecting emotions. Spot on, no denying. A lesson for me today for sure. 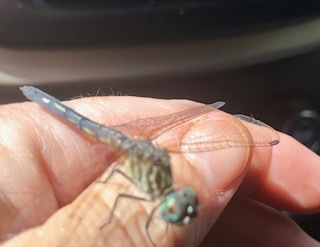 Forever in gratitude to Reiki and to the little dragonfly who took a ride with me. Reiki gave us both what we needed this morning. Beautiful, always the universe reminds us to consider others, to be kind to all living beings and to ourselves.